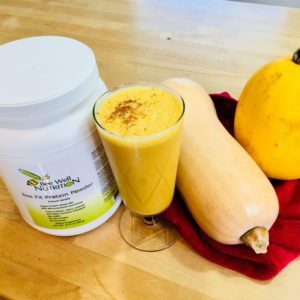 This Healthy Pumpkin Protein Smoothie is a little taste of fall that you can have for breakfast or any time you need a healthy treat! it’s packed with protein , fiber and healthy fats. For an added nutrient bonus, throw in a handful of kale. Pour into a glass and sprinkle with additional pumpkin pie spice.